The early indications are that turnout in the June 5 election will be low. According to Joe Eskenazi, who has a daily text-message service, as of May 27, 43,000 ballots have been returned; at that point in June 2016, 63,500 ballots had been turned in. So every single vote is going to matter. You can vote this weekend at City Hall; you can vote Tuesday at your ballot place. But you need to vote. The person who is elected mayor could wind up serving for the next ten years. And you need to vote for at least two candidates. The top three contenders – London Breed, Jane Kim, and Mark Leno – will likely be within a few points of each other, so this race, and the future of the city, will be determined by the second-place votes of the third-place candidate. We have endorsed Kim and Leno. We offer no recommendation on which candidate you put Number Two; either would be an excellent mayor. 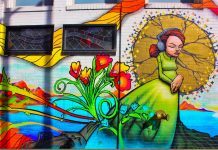 Either would give the city a chance to survive and move past the epidemic of wealth inequality, evictions, homelessness and displacement that have been the legacy of the Ed Lee years. London Breed, on the other hand, is the candidate of the establishment, of the tech elite and the real-estate interests. And frankly, she is not being honest about her record. A surprising number of people who have in the past been progressive leaders are siding with Breed. She is arguing that she will be a “mayor for all San Franciscans.” But like Leno and Kim, she has a record – and it’s important to look not only at what these candidates say they will do but what they have done in the past. Breed consistently sided with the tech industry when progressives sought to regulate the disruption that has so deeply damaged the city. She repeatedly sided with Airbnb, which was devastating the local rental-housing stock, even though she now says she wanted to control short-term rentals. She was a consistent part of the 6-5 majority on the board that supported the Ed Lee agenda. Now, she’s attacking the Tenants Union, saying on KALW that the venerable organization, that has done more for renters in San Francisco than any politician in history, lied about her record. 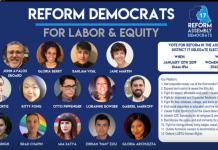 The Tenants Union lists 20 reasons why you shouldn’t vote for London Breed. On Your Call, host Rose Aguilar asked Breed about some of those positions – starting with the fact that Breed didn’t support the anti-displacement measure, Prop. G, in 2014. “What’s the next lie?” Breed asked. She said she did not take a position on Prop. G. Exactly: She did not support it. That’s all the Tenants Union said. It’s not a lie; it’s true. Taking no position means you didn’t support something. Then Aguilar asked about Breed’s vote against regulating tenant buyouts – situations where landlords threaten to evict someone and then offer cash for them to leave quietly. Breed voted against the regulations. You can check out the details of her housing record here. 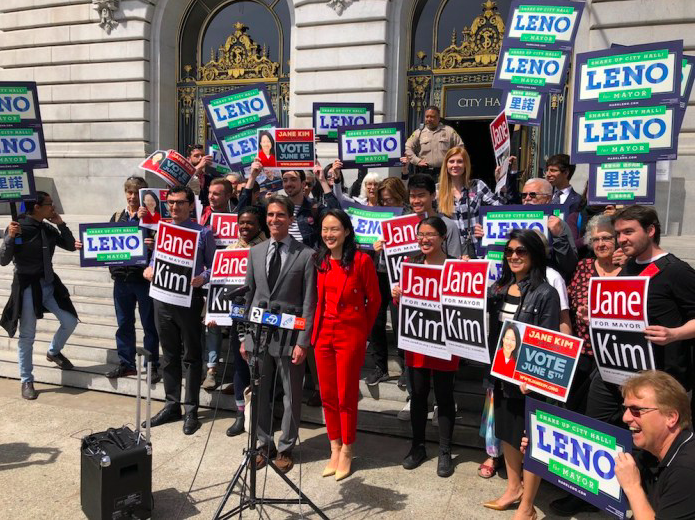 Nearly every progressive organization in the city is backing Kim and Leno. 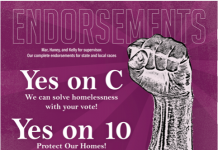 The Tenants Union, The Milk Club, the Sierra Club, the League of Pissed-Off Voters, and the Democratic Party are among those who urge a one-two vote. There are, on the other hand, plenty of Big Tech and Big Real Estate interests pushing for Breed to be mayor. They are attacking Leno and Kim because they believe that either of those candidates would be more likely to tax and regulate real estate and tech. We are convinced that the future of San Francisco requires a mayor who will tax, regulate, and control those interests, who will put the needs of ordinary working San Franciscans over those of the very rich. We believe that the interests of Big Tech and real-estate are directly contrary to the interests of ordinary San Franciscans. We believe that there is no way to solve the homeless problem without extracting significant money from the wealthiest in town to build supportive and affordable housing – and stopping the eviction epidemic. The individual who most personifies the Big Tech takeover of San Francisco politics is Ron Conway, who was close to Mayor Lee and helped set his agenda. He is a big supporter of Breed. He’s also a big supporter of a Republican in one of the key swing districtsthat could determine control of Congress. His agenda is not the agenda of the working San Franciscan. Breed insists that she is not anyone’s pawn, that she will act in what she sees as the best interests of the city. But Conway and his Big Tech and Real Estate folks clearly think that she is the best hope for their agenda. And that’s a good reason to vote for Leno and Kim. There are only a few days left to vote. Please: Go to the polls. Vote for Mark Leno and Jane Kim, or Jane Kim and Mark Leno. The city can’t survive another decade of Big Tech and real estate dominance.